I love coffee. Since putting the brakes on my gut repair protocol (see post here), I’ve been back to enjoying my decaf coffee and yerba mate lattes. So HAPPY! I love my morning routine and it just wasn’t the same subbing kombucha or tea for my AM drinkies. 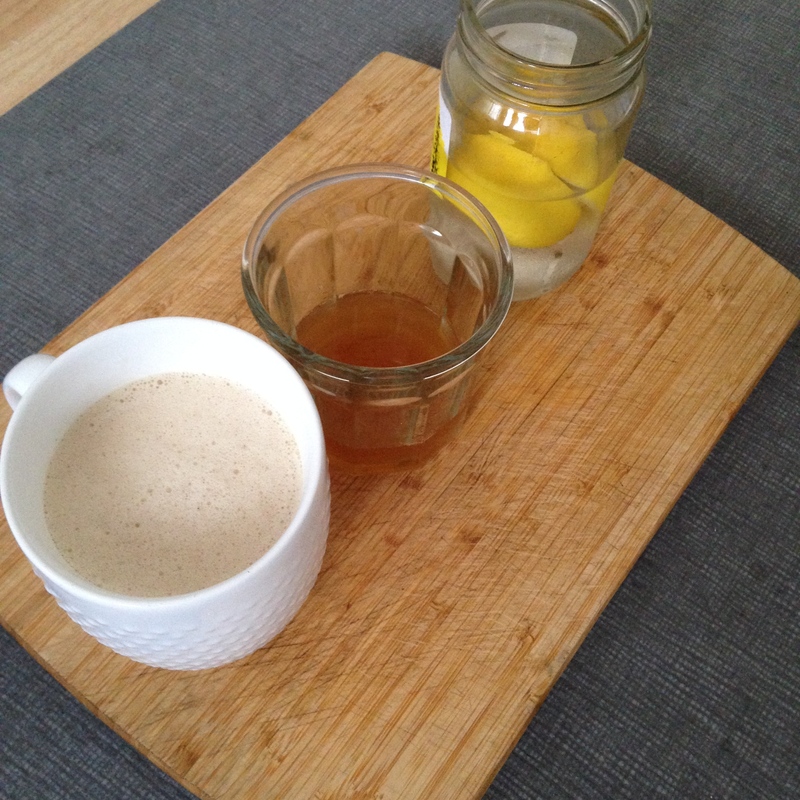 My morning routine drinkies are typically water (with or without lemon), kombucha (drinking my yummy home brew now! ), and some decaf coffee with The Clean Plate’s Coconut Creamer (one of my most popular posts). So far my sleep has been horrible since stopping the gut repair and I’ve been a lot more bloated than normal. Since the cleanse is only 21 days, I’m just sticking it out till the end. I’m halfway through… so no big deal. These symptoms may just be the result of detoxing or a direct reaction to the herbal supplement itself (there are some prebiotics in it, which I tend to give me gut issues). Taken the following Sunday morning. That’s no joke people. When people ask me, what happens when you have digestion problems? What happens when you eat gluten? What happens when you eat normal things like apples, brussels sprouts, or coconut flour? Take a good look at the first pic. That’s what happens. Its frustrating. Especially when it seems like none of my interventions are helping. These pictures are also a good reason why you should never trust “Before/After” pictures in diet ads, pinterest, or Facebook. All it takes is a bowl full of gluten, a bottle of alcohol, or a plate of anything at Claimjumper… and you have a convincing “before” picture. Let’s move on to something more delicious and inspiring… like burgers. I think we all agree that guacamole is amazing. Burgers, also amazing. Bacon, extra super amazing. Combine them all and you have one heck of a summer crowd-pleaser. Fire up your grill and find some ripe, creamy avocados. Your mouth will be happy and anyone else who joins you for dinner. And hopefully you won’t have a “before” picture after this meal. Cook bacon in a pan or bake in the oven at 375. Set aside when done. In a bowl, mix the ground beef with a teaspoon each of salt, pepper, and garlic powder. Add a pinch of red pepper flakes. Divide the beef into 6 even sized balls. Form into very flat patties. Add a large spoonful of guacamole in the middle of three patties. 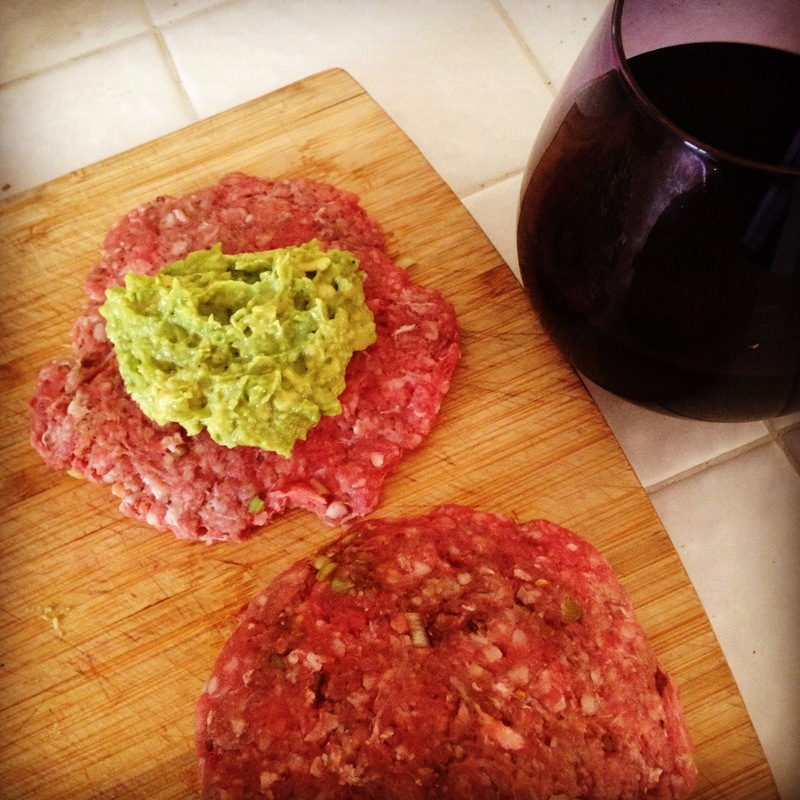 Lay the remaining patties on top of the guacamole patties. Pinch the edges together and form until the thickness is even. Grill for 3 mins on each side. 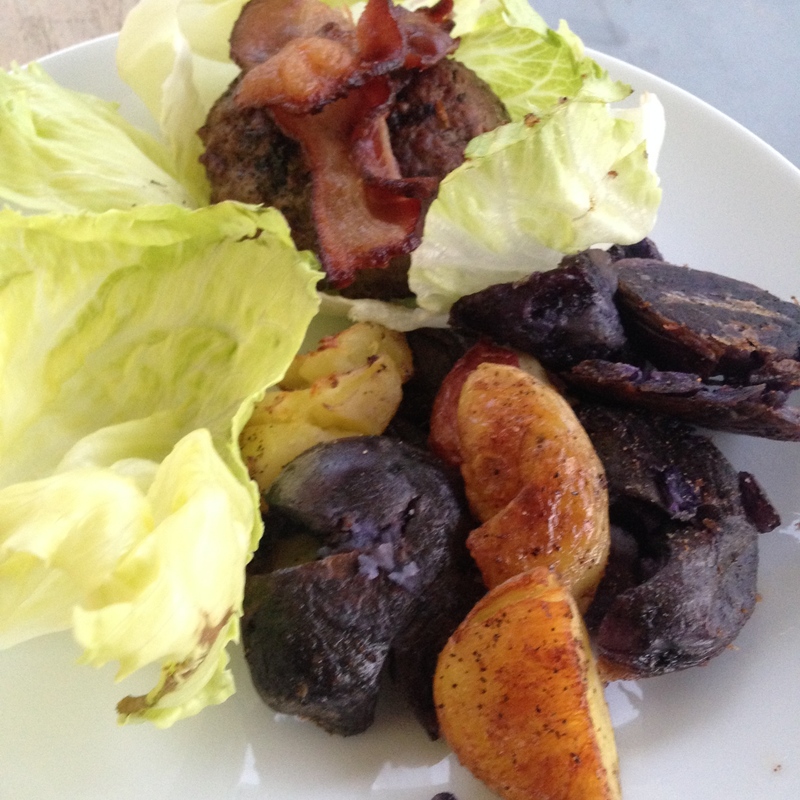 Top with bacon and wrap with iceberg lettuce.